An Analysis of the Economic Circumstances of Canadian Seniors shows a stark picture of inadequate savings and growing poverty, and offers a clear baseline of evidence for the government to expand the Canada Pension Plan. As the Liberal government prepares to table its first budget, the twin challenges of ensuring adequate retirement security and reducing seniors’ poverty are coming into sharp focus. $3,000: The overall median value of retirement assets of near seniors aged 55-64 without an employer pension. 55% of Canadians aged 55–64 with no employer pension benefits have less than one year’s worth of savings. $5,600: The spread for single seniors between the OAS/GIS guarantee levels and the low-income poverty measure for 2015 – the spread that seniors need to fill using the Canada or Quebec pension plans (CPP/QPP), private pensions and private savings. 28% of single female seniors and 24% of single male seniors are living in poverty in this country. We now know the panoply of public policies offering “voluntary” options for saving — such as RRSPs, TFSAs, group RPPs, and pooled Registered Pension Plans — are not addressing the shortcomings in declining workplace pensions and inadequate public pensions. In the short term, the Guaranteed Income Supplement must be boosted for all seniors, not just singles. And there should be no debate that the CPP needs to be expanded! Help us spread the word by sharing this report or one of the social sharables below. activist grandmothers as they fight for peace, social justice and the environment! With disarming smiles, biting lyrics, flowery hats, and a gift for inventive, off-the-wall protest, they challenge authorities and stereotypes alike. Their movement, started in Canada 28 years ago, has become international. 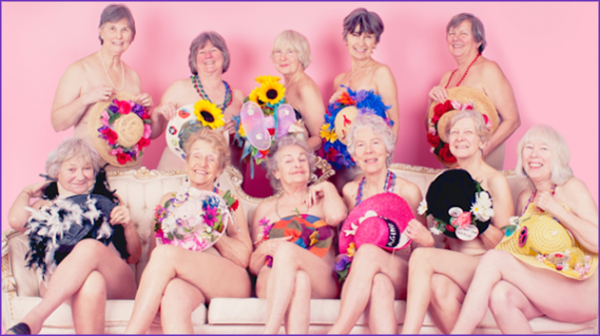 They are deflating clichés about aging and proving that life can be lived to its fullest, in a meaningful way, to the end. They show up, invited or not, at demonstrations, rallies and political events. They are the Raging Grannies, and they fight for peace, social justice and the environment. Canada and Ontario’s population is aging rapidly. Estimates from Statcan show that by July 1 2015, for the first time, there were more persons aged 65 years and older in Canada than children aged 0 to 14 years. Nearly one in six Canadians (16.1%)—a record 5,780,900 Canadians—was at least 65 years old, compared with 5,749,400 children aged 0 to 14 years (16.0%). According to the most recent population projections, the share of persons aged 65 years and older will continue to increase. It should account for 20.1% of the population on July 1, 2024.The absolute numbers of seniors will double from 5.8 million in 2015 to some 10.1 million in 2035. By 2051 roughly one in four Canadians is expected to be 65 or over. Seniors need two kinds of help around housing. Most seniors will need some kind of help to stay in their own housing. This presentation will not concentrate on this very important issue which CAUS has presented on before and is available on our website https://nationalseniorsproject.org/. Rather with the limited time available I will concentrate on the issue of specialized housing for seniors. In Canada, there are, according to the annual study (2015) by CMHC (https://www03.cmhc-schl.gc.ca/catalog/productDetail.cfm?cat=160&itm=31&lang=en&sid=IDM5SENLinTR1QWmKQVCGOL1Vgdm0vMH4mtDE0wVeGofcoNHVhtKZ65xhZukiGLg&fr=1454704723199) , only a total of 224,342 spaces for seniors in Canada. Just less than half of these spaces are in Quebec (111,973). This represents in Quebec a rate of 18.5% of seniors over 75 in seniors’ homes. In Ontario, which has one of the poorest rates of only 5.2%, there are only a total of 53,680 spaces! This is less than half of Quebec’s total and less third of the rate of Quebec. The overall Canadian rate for over 75s is 8.9% which is still very low but much higher than that for Ontario. But it is not just the number of spaces but the cost of this housing that is bad for Ontario seniors. The average rent for bachelor units or private rooms, where at least one meal is included, is now $2,107 per month in Canada. In Ontario, however, the average rent is $2815 per month, one of the highest rates. Compare this to Quebec where the rate is only $1521 per month. Even more unacceptable are the rents per month for seniors in Ottawa ($3134) and Toronto ($3198). What this means is that even if they need seniors housing, only very well off seniors will be able to get housing in these cities. Ontario is thus way behind Quebec, and also behind the Canadian average, and needs a major investment in seniors’ housing. Just to catch up with Quebec would require building some 127,673 new units to have the same rate as they do in Quebec and then with the seniors population increasing from 16% now to 25% by 2051, would demand another major increase of more than 50% of this figure. The new Liberal government is on track to seriously address the growing problem of poverty in old age. But their election promises need some critical reconsideration. Recently released income data from Statistics Canada report that the incidence of low income among the elderly (age 65 and over) has risen from 7.6% in 2000 to 11.1% in 2013. Low income is defined as having an income of less than one half the median or mid point income of a household of the same size. Digging a bit deeper, seniors living in couples had a low income rate of 5.2% in 2013, and senior singles (who are disproportionately women) had a very disturbing low income rate of 27.1%. The rising incidence of poverty among the elderly basically tells us that Old Age Security (OAS) and Guaranteed Income Supplement (GIS) benefits, which together provide a guaranteed minimum income for low income seniors, have not risen as fast as the incomes of all Canadian households. This is not surprising since the OAS and GIS generally rise only in line with inflation, while the working age population has benefited from modest real wage growth. The Liberals have promised to increase the GIS for single seniors by 10%, at a cost of $720 million from 2016-17. Currently, the maximum monthly GIS payment is $773.60 and the maximum annual income from OAS and GIS combined is $1,344.12 or $16,129 per year. GIS payments are reduced for any other income from pensions, investment and employment, and currently go to one third (31%) of all seniors. For couples, the maximum monthly income from OAS and GIS combined is is $2,167. The Liberal proposal to increase the GIS will undoubtedly close a large part of the significant gap between the maximum benefit for singles and the poverty line, and put a big dent in the very high poverty rate for single seniors. This is to be commended. However, the proposal does leave out in the cold the more than one in three (34.2%) of low income seniors who live as couples. As is the case for singles, the maximum OAS/GIS benefit for senior couples which is $2167 per month falls short of the poverty line, to the tune of about $3,800 per year. The Liberals have also promised to index OAS and GIS payments to a new seniors price index instead of to the all items Consumer Price Index. The reasoning is that the broadest inflation rate insufficiently registers increases in the cost of living for seniors. This argument is dubious. A 2008 Statistics Canada study covering the years 1992 to 2004 found that the cost of living for seniors increased only marginally faster than the overall CPI for the twelve year period as a whole, by an average of 1.95% compared to 1.84%. The difference was attributable to one four year period. Research shows that seniors spend relatively more of their income than the general population on some items (food from stores, rent, utilities, health and personal care) but relatively less on other items, (clothing, automobiles and private transportation, alcohol and restaurant meals.) These differences in spending patterns generally offset each other. A new seniors price index could well give rise to other pleas for special treatment, especially given that inflation rates can often differ by province and city as well as by income group. In many respects, the spending patterns of the working poor, also tilted to rent and food, are not that different from those of lower income seniors. A better idea would be to index OAS and GIS payments to the average wage. This would allow seniors to benefit from future economic growth rather than just maintain their standard of living. On a more positive note, the Liberals have promised not to proceed with the planned increase in the age of eligibility of the OAS and GIS from age 65 to age 67. This would have increased the poverty rate down the road by depriving seniors of two years of potential benefits. The status quo recognizes that not all seniors are able to work to age 67 due to ill health and/or caring responsibilities. Taking into account the recent revival of discussions with the provinces to expand the Canada Pension Plan, the new federal government appears committed to a progressive reform of our inadequate income security programs for the elderly. However, they do need to sharpen up some important details. Andrew Jackson is Adjunct Research Professor in the Institute of Political Economy at Carleton University, and senior policy adviser to the Broadbent Institute. This column originally appeared in the Globe and Mail. Photo: Martyn . Used under a creative commons BY-NC-ND-2.0 license. 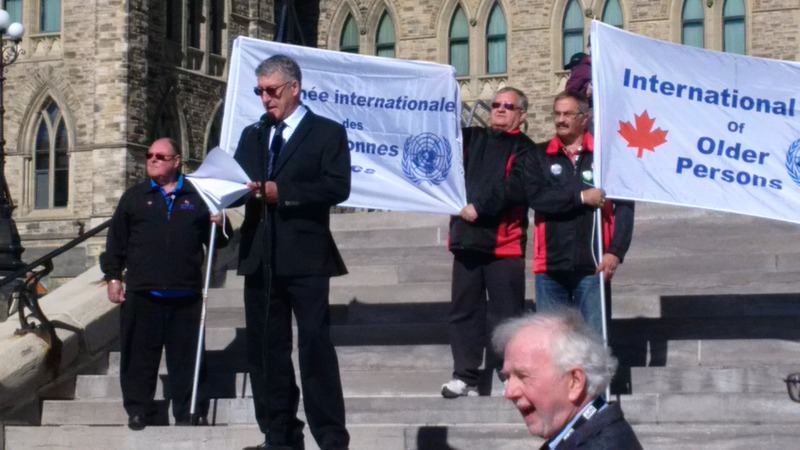 Herb John, President of National Pensioners Federation speaking at the October 1 Rally. Seniors’ Housing: the Need for a National Strategy News story after news story (like those a few days ago) tells us about the huge increase in the number of seniors that is coming over the next years in Canada. But are governments talking about what this means for housing for seniors? We are the only G7 country without a national housing strategy. Should we be surprised from this government that when there is no national housing strategy and no national seniors’ strategy that there is no national seniors’ housing strategy? Estimates from Statcan show that by July 1 2015, for the first time, there were more persons aged 65 years and older in Canada than children aged 0 to 14 years. Nearly one in six Canadians (16.1%)—a record 5,780,900 Canadians—was at least 65 years old, compared with 5,749,400 children aged 0 to 14 years (16.0%). And right now housing is not good for many seniors! Also it is important to underline that there is generally a much higher percentage of seniors in small town Canada than in the large cities, and, yet, it is in these small towns that seniors’ housing and seniors’ services are less available than in big cities. Most seniors do and will remain in their own homes but where are the programs and supports to help them do this? For example, a study of BC seniors housing estimated 50% of seniors who rent have affordability issues. As well many seniors need to have their homes adapted to assure they can continue to live in them and age in place. Ok so what if you are part of the seniors particularly those over 75 who need purpose built seniors housing? Well you will find that there is very little seniors’ housing, and, in general, it is very, very expensive. As of 2015 in terms of purpose built seniors housing, CMHC says that in Canada there were, 224,962 seniors living in 2794 seniors’ housing centres. The vacancy rate in seniors’ housing residences in Canada decreased slightly over the past year, reaching 8.1 per cent in 2015. But of these 225,000 places they are very unevenly distributed Quebec has 111,973 or 49.8% of the total spaces in Canada. Ontario has only 53,680! But just to provide the same access in the future, some 200,000 spaces would have to be built over the next 20 years. Also the cost of seniors’ housing is today very high. Among the provinces, the lowest average rents for bachelor units and private rooms were posted in Quebec ($1,521), while the highest average rents were recorded in Ontario ($2,815). Ottawa has a ridiculously high average rent of $3,134! Because, in part at least, due to these high rates, the rate of seniors’ population aged 75 years and over in seniors’ homes across Canada was quite low, at 8.9%. The highest rate was in Quebec (18.5 %), while the lowest rate of occupancy was in Nova Scotia (1.9%). Development of comprehensive programs to help seniors stay in their own home. Most seniors today remain in their own homes but many need programs that will help them with aging in place. Making improvements to help them make their homes seniors friendly. While some provinces have home improvement tax credits or grants, these kinds of programs are generally very limited. Providing the home care and other health services that will allow seniors to stay in their own homes and not be forced into long term care facilities which for many seniors are not the right place for them and are extremely costly as well as blocking services that could be used by others who really need this kind of care. Creating programs to allow seniors who want to share housing with other seniors. This can help some seniors stay in their own home by providing a new source of income and allow other seniors to remain in a home environment with other seniors. Creation of more purpose built seniors’ housing, including more affordable seniors’ housing, and the upgrading of existing seniors’ housing. Right now we need a new federal government which will move on this issue working with provinces and territories, municipalities and First Nations and take a real leadership role before it is too late! Thursday October I, 2015 is the United Nations International Day of Older Persons. Seniors Vote which regroups more than 50 seniors’ organizations across Canada will be organizing events and rallies across the country. On Parliament Hill In Ottawa at 10:45 AM on October 1 there will be a Seniors Vote rally to put forward the Seniors Vote demands. The National Pensioners Federation is taking a leadership role in organizing this rally. 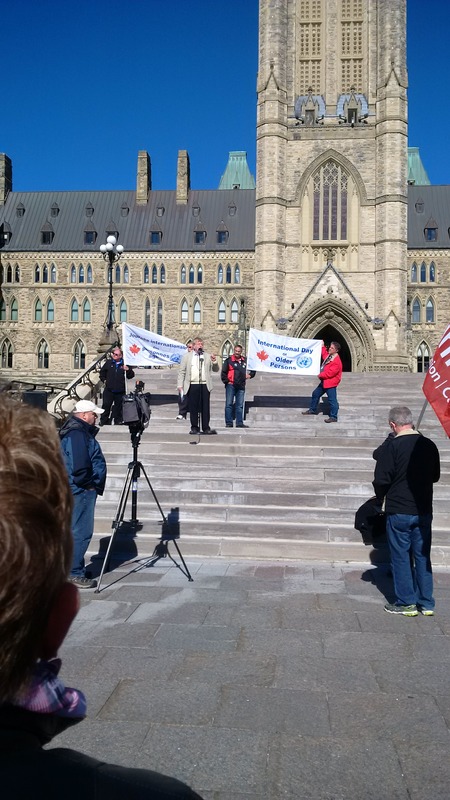 Flag raising ceremonies will be also organized in locations across Canada by CARP on October 1. . This piece was published on April 29, 2015 in the Montreal Gazette. Below this version is the full unedited version. Prime Minister Stephen Harper and Finance Minister Joe Oliver walk together as he arrives to table the budget on Parliament Hill in Ottawa on Tuesday, April 21, 2015. The April 21 federal budget has been touted as “the seniors’ budget” and many have praised the “wins” in the budget for seniors. However, is this really the case? I would submit that most seniors benefitted very little from this budget. Income security including restoring OAS and GIS to age 65 from 67 and increasing the Canada Pension Plan. Health-care reform including increased funding for issues such as home care and a national pharmacare plan. The Canadian Medical Association has called for a national seniors’ strategy on care and health care. A national housing strategy for seniors to let them stay in their own homes or move into purpose-built affordable housing. Fighting inequality to assure all citizens, including seniors, can get out of poverty and their children can have decent jobs, not precarious work. Seniors’ poverty has been increasing in recent years and the latest Statistics Canada figures show 12.1 per cent of seniors now live in poverty (after-tax Low Income Measure). And for single seniors, the rate is now 28.5 per cent! And yet there are no major moves on any of these four issues. Instead the budget contains four measures that do not signify any major progress on any of the above key policy areas. So what does the budget have for seniors? First, the budget increased the maximum annual Tax Free Savings Account contribution from $5,500 to $10,000. While some 11 million Canadians have a TFSA account, only about 1.9 million have maxed out their contributions. So do we really need an increase to the TFSA annual amount? While 92 per cent of those who have maxed out their TFSAs are over 55, among this group the over-65s still represent a minority of Canada’s seniors. Many of these seniors use the TFSA only because they have to find some place for their RRSP/RRIF holdings that they are forced to cash out and pay taxes on after age 71. While some seniors may benefit right now from this policy, future seniors, as well as today’s Canadians, in general, will not. A recent Parliamentary Budget Office report projects that the fiscal impact of the TFSA program this year will be $1.3 billion, or 0.06 per cent of GDP in lost taxes, a $860 million loss to the federal government and a $430 million loss to the provinces. By 2060, Ottawa would lose $14.7 billion a year in total revenues as a result of TFSAs while the provinces would lose $7.6 billion per year. The Broadbent Institute’s report on TFSAs estimated a loss of an annual $15.5 billion in federal revenue within 40-50 years. This is why the finance minister himself recognized that this was a problem and that it would be left to Harper’s granddaughter to solve! The second major plank for seniors in the budget was the change in the mandatory rates of withdrawal from Registered Retirement Income Funds (RRIFs). These changes would mean that a senior who turns 71 would be able to withdraw less than he or she has to withdraw by law now. Existing RRIF rules mean that someone who turns 71 in 2014 must withdraw 7.38 per cent of the 2015 market value of their assets in 2015. The new budget reduces this to a withdrawal of 5.28 per cent. But while this move is positive for seniors who have a RRIF, and who, on average, are living much longer than before, it has to be balanced against the fact that, here again, the government will receive less taxes than before. Even more notable is that the vast majority of Canadians do not contribute to an RRSP (which at age 71 has to be transformed into a RRIF). Therefore this move does not affect most seniors or affects many very marginally, as they have no RRSP or very small amounts in one. So while a few seniors are helped by these moves, it has to be remembered that this is the government which has raised the age of receiving Old Age Security and Guaranteed Income Supplement by two years. This move alone will cost all seniors over $13,000 each and for those among the most vulnerable, who also get the GIS, the amount of loss will be more than double that amount over two years. The third major move touching seniors in the budget is the extension of the Compassionate Care EI leave from six weeks to six months. This is a leave program to help care for a family member who is terminally ill and expected to die within six months and allows a caregiver to go on Employment Insurance to care for the relative. Extending this program is a good idea, but there still are some major problems with this initiative. The first problem is the fact that the measure can be used only for caring for a terminally ill person dying within six months. This is not good enough as many persons, who are very ill, are not diagnosed as terminally ill in this short time frame, but could still use important care. As well, many persons who are the potential caregivers are not working or are self-employed, and thus will not have access to any funds through this program. So while a good improvement, this program needs more work, because as the population ages, we will need many more carers. And this program, even if it were to be increased in cost, is a much cheaper and more effective way of providing care than costly long-term or palliative care. Finally, the budget outlined a non-refundable tax credit for seniors and people with disabilities who undertake home renovation projects. These projects must “allow a senior or a person who is eligible for the Disability Tax Credit to be more mobile, safe and functional within their home.” This would refund a maximum of $1,500 in tax relief on expenses of $10,000. This is positive, but many seniors will not be able to spend the money required to get the maximum credit and, if they have low or no taxes, they will get little or nothing back. A refundable tax credit would mean that many more would benefit. At the same time, necessary renovations, which are paid for by the state or perhaps through a decrease in property taxes, could allow even more to benefit, and, in the end, save money, as seniors can stay in their homes and not rely on more costly long-term care. John Anderson is a director of the Canadian Alliance of United Seniors, a seniors’ advocacy group affiliated with Seniors Vote. He is a public relations consultant who lives in Ottawa, and is a former director of policy and research with the federal NDP. Healthcare reform including increased funding for issues such as homecare and a national pharmacare plan. The Canadian Medical Association has called for a national seniors’ strategy on care and healthcare. Fighting inequality to assure all citizens, including seniors, can get out of poverty and their children can have decent jobs not precarious work. Seniors’ poverty has been increasing in recent years and the latest Statcan figures show 12.1% of seniors now live in poverty (after tax Low Income Measure)[i] And for single seniors the rate is now 28.5%! And yet there are no major moves on any of these 4 issues. Instead the Budget contains 4 measures which do not signify any major progress on any of the above key policy areas. So what does the Budget have for seniors? First, the budget increased the maximum annual Tax Free Savings Account contribution from $5500 to $10,000. While some 11 million Canadians have a TFSA account, only some 1.9 million have maxed out their contributions. So do we really need an increase to the TFSA annual amount? While 92% of those who have maxed out their TFSAs are over 55, among this group the over 65s still represent a minority of Canada’s seniors. Many of these seniors use the TFSA only because they have to find some place for their RRSP/RRIF holdings which they are forced to cash out and pay taxes on after age 71. The future consequences of this plan are stark. If governments will lose some $22 billion per year in tax revenues in the future, many of the social and health programs which seniors now rely on could be threatened. Even more troubling is the government’s overall view that it is up to seniors to save for their future, and if they do not or cannot, then it is just too bad because governments will not have the resources to help them. The second major plank for seniors in the budget was the change in the mandatory rates of withdrawal from Registered Retirement Income Funds (RRIFs). These changes would mean that a senior who turns 71 would be able to withdraw less than he or she has to withdraw by law now. Existing RRIF rules mean that someone who turns 71 in 2014 must withdraw 7.38% of the 2015 market value of their assets in 2015. The new budget reduces this to a withdrawal of 5.28%. This means as this chart below shows they would be able to keep more in the RRIF as they grow older. But while this move is positive for seniors who have a RRIF, and who, on the average, are living much longer than before, it has to be balanced against the fact that, here again, the government will receive less taxes than before. Even more notable is that the vast majority of Canadians do not contribute to an RRSP (which at age 71 has to be transformed into a RRIF). Therefore this move does not affect most seniors or affects many very marginally, as they have no RRSP or very small amounts in one. Statcan noted that just under 6 million taxfilers contributed to an RRSP in 2012, virtually unchanged from 2011, and this was only 23.7% of the total number of taxpayers, down from 24.0% in 2011. So while a few seniors are helped by these moves, it has to be remembered that this is the government which has raised the age of receiving Old Age Security and Guaranteed Income Supplement by two years. This move alone will cost all seniors over $13,000 each and for those among the most vulnerable, who also get the GIS, the amount of loss will be more than double that amount over 2 years. The third major move touching seniors in the budget is the extension of the Compassionate Care EI leave from 6 weeks to 6 months. This is a leave program to help care for a family member who is terminally ill and expected to die within 6 months and allows a caregiver to go on Employment Insurance to care for the relative. Extending this program is a good idea, but there still are some major problems with this initiative. The first problem is the fact that the measure can be used only for caring for a terminally ill person dying within 6 months. This is not good enough as many persons, who are very ill, are not diagnosed as terminally ill in this short time frame, but could still use important care. As well, many persons who are the potential caregivers are not working or are self employed, and thus will not have access to any funds through this program. So while a good improvement, this program needs more work, because as the population ages, we will need many more carers. And this program, even if it were to be increased in cost, is a much cheaper and more effective way of providing care than costly long term or palliative care. Finally, the budget outlined a non-refundable tax credit for seniors and people with disabilities who undertake home renovation projects. These projects must “allow a senior or a person who is eligible for the Disability Tax Credit to be more mobile, safe and functional within their home”. This would refund a maximum of $1500 in tax relief on expenses of $10,000 or a 15% credit. This is positive but many seniors will not be able to spend the $15,000 to get the maximum credit and, if they have low or no taxes, they will get little or nothing back. A refundable tax credit would mean that many more would benefit. At the same time, necessary renovations, which are paid for by the state or perhaps through a decrease in property taxes, could allow even more to benefit, and, in the end, save money, as seniors can stay in their homes and not rely on more costly Long Term Care. So in the end, while parts of these four measures may help some seniors, particularly those with higher incomes, most senior’s lives will not be improved in any significant manner. We still need real action on the four major concerns we outlined at the start of this piece. This is not the “seniors’ budget we need”!